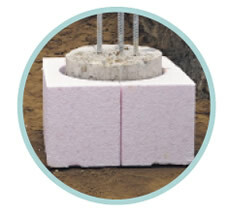 Claymaster is a compressible expanded polystyrene, specially manufactured within a critical density range. 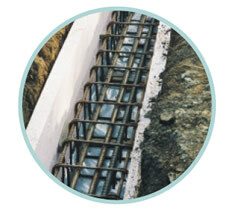 It is Agrément approved and designed to alleviate the lateral force of ground movement on foundations. Claymaster does not compress significantly until loads exceed 20kN/m2. A load of 40kN/m2 is needed to produce 50% compression. Consequently its use is not recommended under ground floor slabs. compress to accommodate selected levels of predicted ground movement. service on length and width, with special shapes like circular sections cut to order. Deep Trenchfill is a traditional type of house foundation and where necassry Claymaster is used to protect the sides agains ground movement. Due to more conomic piling methods, disposal cost of excavated material and stricter Health & Safety regulations, its use is declining.